Interviews with victims and witnesses to the Sept. 16 shooting in Nissour Square bring to light more information about the problems caused by private contractors, which have effectively operated with impunity as they've brought violence and widespread ill will to US operations in Iraq. At first, this seemed completely normal for the totally abnormal world of Baghdad in September 2007. "Convoys are common," explained Khalaf. But this convoy made an unexpected U-turn, drove the wrong way around the one-way square, stopped in the middle of it and started shooting. Fifteen minutes later, 17 Iraqi civilians were dead, dozens more wounded, and a white sedan that had been engulfed in flames contained two bodies charred beyond recognition. "It was a horror movie," said Khalaf, describing the aftermath of the now notorious Blackwater shootings. I interviewed Khalaf on Nov. 30, in a small conference room inside a hotel in Istanbul, Turkey. In one of the most in-depth collection of testimonials to date regarding Blackwater, Khalaf was among five witnesses and victims flown from Baghdad to meet with Susan Burke, William O'Neil and their team of lawyers and investigators. The team is suing Blackwater on behalf of the victims of the Sept. 16 shooting. That lethal incident was a watershed moment that brought intense scrutiny to the problems caused by private contractors, which have effectively operated with impunity as they've brought violence and widespread ill will to US operations in Iraq. With experience learned from a similar lawsuit filed two years ago against US contractors implicated in the infamous Abu Ghraib prison scandal, Burke O'Neil is perhaps the only law firm in the nation that could so quickly gather eyewitness and victim accounts, make the right legal arguments and begin the process of holding Blackwater to account. Sadly, this lawsuit may be the only way that the victims and their families receive remotely adequate compensation for their losses. Khalaf recounted the events of that day to a hushed room of lawyers with laptops. He watched, he said, as the Blackwater convoy made the U-turn toward the street where he stood directing traffic. As the convoy stopped, Khalaf watched as a large man with a mustache standing atop the third car fired several shots in the air. Khalaf turned back toward the Yarmouk road to see what might have spurred the shooting and heard a woman yell, "My son! My son!" He ran three cars back to a white sedan to find a woman holding a young man slumped over and covered with blood. The man was Ahmed, a 20-year-old medical student at the top of his class, and the woman his mother, Mohasin, a successful dermatologist and mother of three. "I tried to help the young man, but his mother was holding him so tight," said Khalaf. "I raised my left arm high in the air to try to signal to the convoy to stop the shooting," he said, thinking that it would respond to such a gesture by a police officer. He described how he crouched by the car, his right arm reaching inside, his head out and left arm up in the air, signaling to the convoy, his gun secure in its holster. Then the mother was shot dead before his eyes. The shooting then turned heavier, Khalaf said, his eyes red-brimmed and serious. He hid behind the police traffic booth, but shots came directly at him, hitting the adjacent traffic light and booth's door, and he fled back across Yarmouk road to safety behind a hill. Along with a few hundred others, he stayed there as the chaos unfolded, watching as the helicopters circling above the street started shooting at those below. Fifteen minutes later, the four-car convoy continued around the square and drove away. Amid the wreckage, colorful clouds billowed into the air from the convoy's parting gift -- multicolored smoke bombs. But the accounts of Khalaf and others contradict each of Prince's assertions. Khalaf, who was there before the shooting began, said he never saw anyone fire on or approach the convoy. He watched as all four cars drove away as the 15-minute shooting spree ended, and huddled in fear as the helicopters began firing. He thought the helicopters would start spraying those who were hiding behind the hill for safety from the street-level threat. Khalaf's observations are backed up by official accounts, including leaked FBI findings, which concluded that at least 14 of the 17 shooting deaths were unjustified, and statements by military officials disputing Blackwater's claim that its guards had been fired upon or under any sort of attack. The Iraq government's own investigation found no evidence that the guards had been provoked or attacked, and Prime Minister Nouri al-Maliki's spokesperson called the shootings "deliberate murder." The scene as the Blackwater convoy exited the square was also described to the group of lawyers by Hooby, a 32-year-old bank employee who was there on lunch break, returning from a failed attempt to buy a gift for a friend's newborn. (An unrelated bombing in a nearby market cut the shopping trip short.) Stuck in heavy traffic on the opposite side of the square from Yarmouk road, he heard the shooting start. When he got out of his car to find out what was happening, he saw the convoy and the white car burning, and started yelling at the other cars to turn around. Two helicopters circled overhead, each with a man strapped in and a machine gun sticking out. In a panic, Hooby turned his car around and was leaving the area when the convoy approached from behind, throwing water bottles at the roof of his car. "All of a sudden, I felt pain in my right arm and left leg, opened the car door, and rolled out," said Hooby. The car rolled forward a short way, hit a wall and stopped, said Hooby. "I thought I was dying." He spent the next three days in the hospital and underwent major surgery on his right arm, which was fractured by a bullet. He spent the next two months at home, recuperating. The large metal rod implanted by the surgeon to help his broken bone heal properly is expected to be removed at the end of December. Like Khalaf, Hooby said he never saw anyone on his side of the square make even a threatening gesture toward the Blackwater convoy. Now, left to deal with the aftermath are 16 grieving families, and those, like Hooby, still trying to recover from their wounds. Haythem, the composed, articulate and powerfully calm father and husband of Ahmed and Mohasin, who died in the white car, expected them to pick him up at the health center where he worked that afternoon. He waited and waited, and eventually went home without them. "I tried to be patient," he said. "I kept calling, but thought there must be some sort of cellphone interruption." Finally, around 5 p.m., he phoned his brother who worked at the hospital closest to Nissour Square. His brother went to the emergency room, then to the morgue. He learned that all of the bodies there were identified -- except for two that were completely burned with body parts missing. His brother then headed to the square, where he called Haythem to tell him he had found a charred white car with a license plate number written in the sand. The numerals and letters matched the family's plate. Haythem identified his son from what was left of his shoes. His forehead and brains were missing and his skin completely burned. He identified his wife of 20 years by a dental bridge. 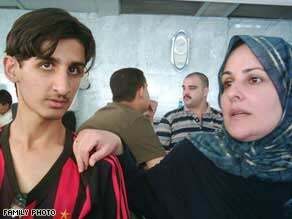 With tears in his eyes, Haythem described his beloved wife and son. "If you perceive marriage as half of your life, Mohasin was my best half," he said. "We were always together. I don't know how to manage my life or care for my other two children without her." Ahmed "was my first baby boy," he said. "Everyone loved him." The State Department contacted Haythem and asked how much he wanted for compensation. "I said their lives are priceless," said Haythem. But the State Department representative kept insisting on a number. Haythem eventually told him that "if he could give me my loved ones, I would gladly give him $200 million." None of the Iraqis we interviewed last month could describe their losses without breaking down in tears. Assadi, 31, a stoic, unsmiling man, became the head of the family after his older brother Usama was killed in the shootings. His tough façade cracked as he described the moment he learned about the shootings. His brother left behind a wife and four children. Assadi is now the sole breadwinner for the entire family. He documented what was left of his brother's car. The line of bullet holes in one side door is overshadowed by the two soccer-ball-size holes in the roof and driver's side door. Another young man, 27-year-old Abu Hassam, suddenly became the head of his family just a week earlier, when on Sept. 9 his older brother was shot in front of the family's carpet shop -- in an incident also attributed to Blackwater. His brother's wife had delivered their first child, a daughter, just 20 days earlier. At least four other Iraqis have been reported killed in that incident on Sept. 9. These are not isolated events. In October, the US House Committee on Oversight and Government Reform released its analysis of Blackwater's own internal reporting since 2005, which found 195 shooting incidents in the last two years, including 160 in which Blackwater employees fired the first shot. And Blackwater is not the only problem. An estimated 20,000 to 35,000 private security contractors operate in Iraq, without adequate oversight, without adequate training and without adequate legal sanctions to hold abusers accountable. The Burke O'Neil lawsuit may be the only way that victims receive compensation for their loss. The State Department has offered family members $10,000 for those killed in the Sept. 16 shootings -- an amount most consider insultingly low and have refused. In less high-profile cases involving US contractors, no one has offered anything. Some of the Iraqis told me that they don't even care about the money. They just want to see those responsible punished. But the Iraqis' hands are tied. An order issued by the Coalition Provisional Authority in its departing days and still in force gives foreign private contractors immunity under Iraqi law. US prosecutors are now reportedly trying to build a case against those involved in the Sept. 16 shootings. If successful, it will be the first time the US government has held private security contractors criminally liable for abusive behavior directed at Iraqis. In other cases, investigations don't even get off the ground, because of lack of political will, limits in the extraterritorial reach of US criminal laws, and the absence of investigative units on the ground. Even in this case, the FBI did not visit the crime scene for more than two weeks after the incident, during which time State Department investigators interviewing Blackwater employees offered them limited immunity, complicating the prosecution. Legislation now working its way through Congress would resolve some of the gaps in the law, and hold all US private security contractors subject to criminal sanctions for felonies committed abroad. But such legislation is only as good as the oversight and enforcement that accompany it. A few token prosecutions of a handful of Blackwater employees will not be enough. There needs to be a wholesale reform of the way security contractors and those that oversee their work do business. At stake is the future of other innocent lives, as well as America's reputation throughout the Middle East and across the world. One of the men I met in Istanbul wrote me after I returned home. "Conduct our deepest love to all the Americans who support and work hard to stop killing of innocent people all over the world," he said. "Please, we want to live in peace, surrounded by friends not killers."